Brash the aubergine slices with the olive oil and sprinkle with some sea salt. Heat a large frying-pan over a medium heat. Fry the aubergine until browned and soft on both sides, about 10-12 minutes. Remove from the heat and leave to cool. In a small bowl, whisk together the balsamic vinegar, extra virgin olive oil and lemon juice. 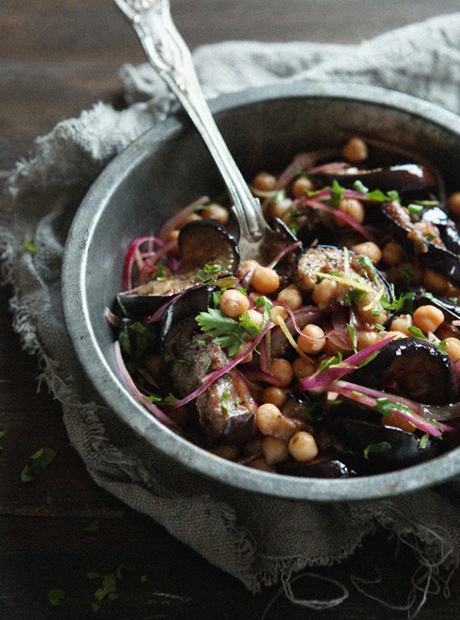 Drain and rinse the chickpeas, place into a bowl with the aubergine, red onion, lemon zest and parsley. Toss with the dressing, sprinkle with back pepper. You are currently reading Chickpea & Aubergine Salad at Fish Trip Cafe.